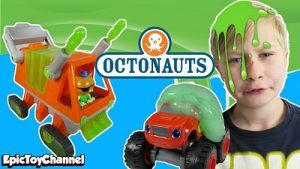 This is a great collection of eight 10 to15 minute episodes featuring our favorite underwater explorers, The Octonauts. We follow along as Captain Barnacles and his crew explore the world’s oceans, rescue the creatures who live there and protect their habitats. This collection has episodes with wild creatures such as Sea Snot Cucumbers, Mudskippers, Marine Iguanas and Slime Eels! The Octonauts teach lessons about the importance of helping others and preserving the world around us-above and below the waves! Bonus Features include episode selection and in-depth explanations of all the sea phenomena featured in the episodes via short animations and fun songs! This DVD is suitable for ages 3 to 7. It’s fun, silly and informative on a relatable level. KIDS FIRST! Film Critic Morgan B., age 11 comments, “I like that they have so many different characters who all love to help sea creatures and find out more about them. It is really great that they are helping young kids learn about the ocean and spark their curiosity about the creatures who live there.” See her full review below. Do you like adventure, fun and marine biology? Then Octonauts: Slime Time is the perfect DVD for you and your family to watch together. This animated collection of eight shows offer fun-filled adventures where you learn about all kinds of fascinating creatures including algae, snot sea cucumbers, slime eels, marine iguanas, mudskippers, sea skaters, sea pigs and even giant squid. This is a really great collection of shows that are educational, exciting, interesting and fun to watch. I like that they have so many different characters who all love to help sea creatures and find out more about them. It is really great that they are helping young kids learn about the ocean and spark their curiosity about the creatures who live there. One of the best features of this collection is that at the end of each episode they have a creature report which reinforces, through song, all the informational things for that episode and includes a clip of what the actual real creatures look like. Even though there are many different characters which I enjoyed very much, my absolute favorite is Shellington (Keith Wickham). He is goodhearted and very inquisitive about oceanic creatures. The way he voices this character truly adds brilliance and friendliness to it. There is also Tweak (Jo Wyatt), a smart southwestern rabbit, Captain Barnacles (Simon Greenall), a kind polar bear, Dashi (Teresa Gallagher), an adorable dog, Peso (Paul Panting), a goodhearted penguin and Kwazii (Rob Rackstraw), a daredevil cat pirate. There is a wonderful gang of all kinds of animals and vegimals (Michael Murphy) who are just too cute for words. Their different personalities all come together as they help some fascinating creatures of the sea. My favorite episode is with Marine Iguanas. I loved it because it is fun to watch and I had no idea that these creatures even existed and learning about them was incredible. This episode also involves a bit of a mystery and is very quirky. I learned quite a lot and loved seeing what they looked like in person in the creature report at the end. I recommend this show for ages 4 through 18. Younger kids will love the animation and will learn about some terrific creatures. Older kids and adults will learn new things about these stupendous creatures and might even learn about a couple they never knew about before. I give this DVD 4.5 out of 5 oceanic starfish.